If you want really BIG SOUND from your portable media device or laptop, nothing beats connecting it to your home's main audio system. This premium 3.5mm (1/8" headphone plug) to 2 RCA (right/left) stereo patch cable is what you need to bridge the gap. Simply plug the 3.5mm plug into the headphone jack of your device or computer and the 2 RCAs to the left and right auxiliary inputs on your sound system. Features: Gold Plated connectors for corrosion resistance and reliable connectivity. Heavy duty 22AWG wires for lower signal resistance and stronger signal integrity. 12mm x 6mm thick cable bodies! Shielded to resist external signal interference. Molded connectors. Extra heavy duty 3.5mm connector housing. 15mm Diameter x 41mm Long! Please note the dimensions of the connectors and cable body above! These are thick, heavy duty cables designed to provide the best signal transmission possible. 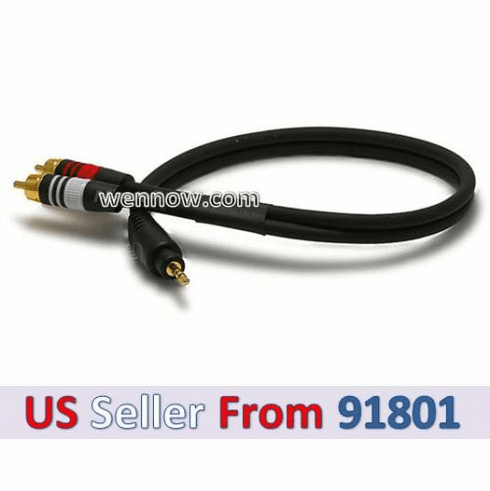 They are great for stationary applications such as connecting a PC to a home theater system or an iPod at rest to a stereo. However, they are not as well suited for small portable applications where lightweight and high flexibility are desired. If you want a heavy gauge interconnect to ensure the highest signal integrity possible, these are the cables for you. If you want something light and portable please consider our standard 3.5mm cables.